Planning and land development take place within a regulatory framework. There are federal, state and local laws regulating a spectrum of issues, from environmental clean-up standards for a former industrial site to how high a fence can be in your front yard. If there’s too little regulation, or not the right kind, consumers and communities suffer the consequences, most notably around issues of safety and the environment. If there’s too much regulation, the private sector goes elsewhere, or may selectively build where it can pass the additional costs of regulation onto well-to-do consumers who can afford it. For our purposes: the regulatory environment in any given state or locality plays a huge role in what kind of market activity happens there. I’ve worked and volunteered largely in the public and not-for-profit sectors. However, I learned early on in my work in affordable housing that municipal and non-profit developers have to think and act like private sector developers if they want to achieve their mission. If a project fails, they may never get another chance. Also, they are not using their own money and have to carefully consider what level of risk is appropriate to assume on behalf of their public funders/taxpayers or private donors. But no matter what your end product, you have to be savvy if you’re getting in the game. Land development is not for the faint of heart. When my kids were young and attending a small Montessori school in central New Jersey, I took a spot on the board as this 20-year-old organization was re-negotiating a lease and found itself with a healthy surplus. When faced with the question of how/if the school wanted to grow, we decided to consider all possibilities: renovate and continue to lease at the current location; purchase and renovate a building nearby; or look for land and build a new school. Within a 3-year period, I led the school – with a lot of help from staff and other parent volunteers! – through the analysis, planning and construction of a new 10,000 square foot facility just about a mile from the old location. It involved negotiations with the current landlord, working with a realtor, scouting properties and options, constantly running in-house financial analyses and income/expense projections, lining up an architect experienced in designing pre-schools, getting a land use lawyer, a builder, and securing construction financing and permanent tax-exempt bond financing through a local bank, with the services of a bond lawyer. Developers put money into escrow with a municipality when they put in an application for approval. The town’s engineers, codes staff and planners are all getting paid from that escrow account when they do their reviews of the application – all those nit-picky details that are supposed to ensure the “health, safety and welfare” of the eventual users of the buildings, roads, parking lots, etc. And every time a developer has to talk to his own lawyer, architect, planner or engineer, the meter is running. Once the project starts, municipal inspections have to be timely; enforcement can’t be arbitrary. Because construction financing is typically at a higher interest rate than permanent financing, if a project’s timeline keeps getting extended, it could sink the project, or at least result in serious losses for the developer. A clear, streamlined set of regulations, consistently enforced in a timely manner, is critical for enticing the private sector to choose your town over another town for the location of their buildings and business. The logic is similar for potential home buyers and small business owners, whose budgets have an even smaller margin for error. No one is going to put their hard-earned money into play – whether it’s for a home in the historic district or for retail space on High Street – if there’s a great deal of uncertainty and wasted time in the land use approval and enforcement processes. Who needs it, if things are likely to go smoother elsewhere? Another First Saturday on tap! Hi Sue, this post brings up a question. Can a certain regulatory climate (zoning laws, etc.) ‘drive development’ to certain areas? I have lived my whole life on the edges of suburban Philadelphia. I grew up outside of Coatesville, Chester County and for the last 10 years, I’ve lived in the Tri-County Area-4 in West Pottsgrove and the last 6 in Pottstown Borough. It seems to me that the overwhelming majority of new development takes place in suburban or exurban ‘greenfields’. Is this due to market forces, i.e. this is the type of development that the public wants and this kind of development is cheaper for a developer, OR is this more driven by municipal zoning requirements, or is it a combination of both? In my 6 years living in Pottstown, the biggest new PRIVATE development I have seen is the Wawa on East High Street and the big bank building on High and Hanover being turned into offices for the Tri-Coumty Chamber of Commerce and the Brickhouse Restaurant. I find this interesting because the Pottstown Regional Planning Commission has been given glowing reviews by agencies across the commonwealth such as 10,000 Friends of PA because the mission of the commission is to primarily preserve open space and ‘direct’ development to the borough and its neighborhoods. What I have seen is tremendous development at the borders of the borough, i.e., the new Giant and Target shopping center in West Pottsgrove Township. Town Square (Lowes’, PetSmart, etc.) in North Coventry. I’m not an urban planner, nor do I profess to be an expert in real estate development, but I thought that parcels with existing infrastructure (underground utilities, water and sewer hookups, roads, etc.) would make for a less expensive project, rather than adding all of those necessities in the middle of a cornfield. Thanks for your reply, Andrew. You raise a lot of issues. I’ll do my best to respond, although it’s tricky in some cases because there’s an interconnectedness to public policy, regulation and market forces that isn’t always easy to tease apart. Is suburban development what the public wants/demands? We could go around in circles on that, just like we could on fuel-efficient cars vs. SUVs. Do people “want” one or the other, or are they “sold on” one or the other? In general, developers prefer wide open spaces – a clean slate. The aspects that are easier and cheaper: no land clearing, no contamination (although there can be from some farm operations), no building demolition, easier site planning (less fees for architect, planner, engineer). When you do “infill” development in urban areas, design costs add up – the new structures need to be in harmony with what’s already there. Things that might cost more out in the farmfields: bringing utilities, water, sewer, roads/streets to the site; environmental constraints like floodplains, wetlands, steep slopes, need for detention basins, etc. Once housing developers get their product formula down, though, it’s pretty easy to replicate anywhere there’s open land. And they will certainly follow the path of least resistance. If a town’s master plan says they want X kind of housing or X kind of commercial development in specific locations, and their zoning is written to allow that, then, yes, developers are going to do business there, where their product is wanted and the rules/regulations are clear. While bringing infrastructure to a cornfield may be expensive – but not always, depending on where exactly that cornfield is; sometimes they abut a town’s sewer & water lines – it’s pretty obvious that the return on investment is worth it to all the housing developers who kept doing it for the past twenty years or so. And, sometimes, when a large area of a town was slated for growth, all the developers showed up at once to share the infrastructure costs, and that’s when you’d see fields transformed seemingly overnight. The book and video “Save Our Land, Save Our Towns,” by Tom Hylton articulate very well the history and forces behind suburban sprawl and the case for living in more compact settlements, i.e., older towns. In older towns like Pottstown, where there’s already infrastructure, they still need to say in their master plan what they want and craft clear ordinances to support that. They also would want to provide incentives for some activities that they know the private sector would not normally jump all over because they wouldn’t see enough profit. There could be assistance with site assembly, temporary tax abatement, density bonuses, temporary/graduated rent subsidies for new businesses. With this approach – “here’s what we want, here’s how you can do it, here’s how we’ll help you do it” – you at least have a shot of competing with any other town for the attention/$$ of the private sector. My take is that, in general, there’s still a major disconnect between regional thinking/talking/planning and the nuts-and-bolts reality of ordinances and public/ political will in the participating communities. This is everywhere, not just the Pottstown area. Doing things regionally means making trade-offs for the benefit of a larger entity, of which you are a part, but to which no one is directly accountable. Usually those trade-offs are either not made explicit, so business continues as usual. Or they just seem too onerous in the short run. e. g. Why should we turn down a brand new shopping center (clean ratables) and “force” the developers to stay in an older town, where taxes keep going up? They’ll just find another town anyway. We need money for our schools, too. Regarding Pottstown, my take is that something is not working in the “directing development to the borough” part of the equation. Directing = attracting. And that is what has been missing – attracting developers with clear plans, ordinances and incentives. And then there’s the human face(s) on all this. The Borough has to be out there selling itself, telling its story, talking it up. Regional plans or not, this is a competition, and Pottstown has been on the sidelines for a long time. Andrew, are you sure you’re not actually an urban planner?? Sue has it right Andrew. The developments in North Coventry came prior to the regional planning organization and its subsequent plan being implemented. However the development in West Pottsgrove did not. Sue’s observation about political will is relevant because there is nothing to compel those who participate in this body to follow its tenets. I am not advocating that there should be, only that when, exactly as Sue said, the opportunity presented itself, West Pottsgrove jumped on it. The regional group had little it could do because if they opposed it, West Pottsgrove made it clear they would simply drop out of participating in regional planning. Now Upper Pottsgrove is facing the same choices with its movie theater development. Both developments not only have an immediate impact on Pottstown (stormwwater, traffic) but both literally stole businesses from their neighbors: Giant and Staples in West Pottsgrove’s case and Carmike in North Coventry’s case. This of course raises the chicken or the egg question, what if you made a plan and all the people who signed on to it ignored it when it didn’t serve their purposes? The regional group had to face the question: Is it better to allow this to go through and at least keep it in the region and keep West Pottsgrove on the hook for some form of participation, or do we take a stand, lose a partner and see it happen anyway? Their choice was obvious, but it begs the first question: why have a regional plan if no one follows it? The latest effort is to conduct an economic market study which basically asks and answers the questions most consumers ask — just how many Home Depots, Best Buy’s, Applebees, Wal-Marts, Kohl’s, Targets — can this market support? And then adjust the zoning accordingly. That effort, which will help, won’t happen fast I predict. Sue’s other point is particularly on target: You can’t force people to develop in Pottstown, you can only attract them. I would score Pottstown’s efforts in this arena as a kind of hit or miss. It’s a tough sell to begin with, but I also do not see that Pottstown has lined all its ducks up in a row so that it is putting its best face forward, primarily from a marketing stand point. People continue to get hired to do this and eventually, the right person will get it done. The current hope is floating with the ULI-inspired Pottstown Partnership. Time will tell. Sue and Evan, thanks for your comments. Sue, to answer your last question first, I’ve actually given serious thought to going back for a graduate degree in urban planning. Although, as a married, 36 year old father of two young girls, a mortgage holder, and the fact that my wife and I are still attempting to pay off our existing student loan debts, I don’t think it is in the cards for me at this point. I am extremely interested in these types of discussions. I’d like to focus on something that you both brought up in your responses to my original inquiry and that is Pottstown’s ability to ATTRACT investment and development. One thing about Evan’s fine story last week about Musikfest in Bethlehem, is that I was very surprised to learn that both Musikfest AND Chriskindlmarkt are each less than 20 years old. I’ve never been to Musikfest, although I’ve been to the Chriskindlmarkt on a couple of occassions and I can honestly say that it is hard to believe that this event is as young as it is. It seems to me that Chriskindlmarkt and Bethlehem are made for each other and it seems like BOTH events are already part of the fabric of life in Bethlehem. 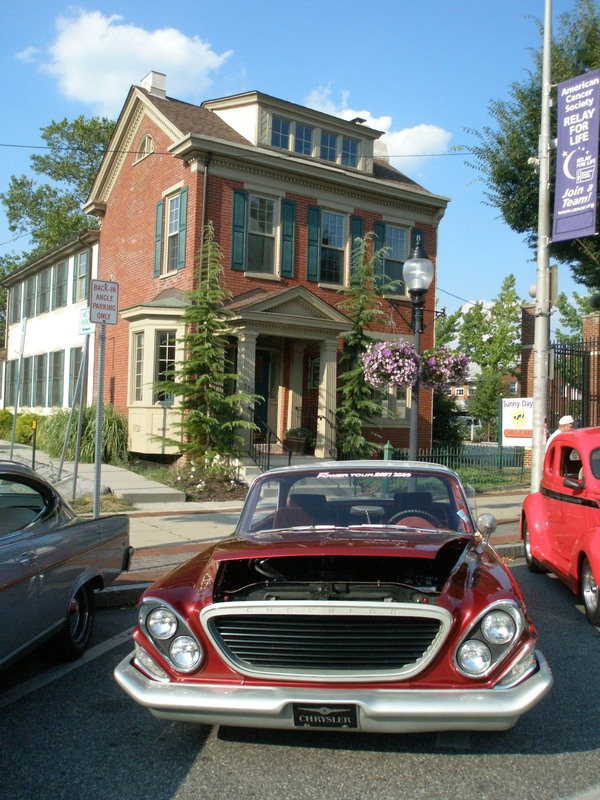 Both events build off of the German and Moravian Heritage of the City and the region. That being said, I also agree with Amy Francis’ comment that Pottstown ‘needs to find it’s own thing’. Here are some similarities between the two communities: the population of Paducah is roughly 26,000 souls, not all that much larger than Pottstown’s 22,000. Both have wonderful period architecture in their downtowns. Both are riverfront towns. Both have inexpensive and beautiful real estate. Anyway, Paducah has been profiled in the New York Times for its remarkable comeback, almost solely through arts and artists. I read the profile and after I visited the website listed above, I found myself asking, why couldn’t this be duplicated here in Pottstown? Finally, I would like to say that I honestly believe for a ‘quick revitalization’, like the one that has happened 8 miles down 724 in Phoenixville, Pottstown needs a ‘perfect storm’, at least for a short period of time. What I mean by that is, business, community, and elected officials MUST come together and agree on a plan to implement some ideas to move forward. Communtiy Assets MUST be identified and enhanced. If I’m not mistaken, many of these assets have already been identified in the ULI report. Political infighting MUST be kept to a minimum. Here is where Pottstown falls short in my opinion. Our existing assets, (think Riverfront Park, and the Pottstown Farmers Market, don’t really get marketed or at least marketed well. How many towns the size of Pottstown have their own year round indoor community market? Not many. Why hasn’t the borough attempted to attract downtown development to link Riverfront Park with the rest of downtown? Why hasn’t PDIDA attempted to lure a river themed sporting goods retailer to High Street? Think kayaks, canoes, fishing rods, fishing licenses, etc. Sue and Evan, I apologize for rambling. You see, I have adult ADD so sometimes it is difficult for me to stay on subject. In any case, I have a lot of ideas, although I don’t have the finances, to bring these ideas to fruition. Who would I direct my concerns and suggestions to? PDIDA, Tri-County Chamber, Borough Hall, all three? None of the above? Please, please, PLEASE follow up on your idea to hold monthly Positively Pottstown round table discussions. Even though I am not available most nights because I am home alone with my children, I would LOVE to meet with like minded folks and rap about ways to revitalize this sleepy, post-industrial town. Thanks again for listening and reading. Fortunately, planning activities are available for anyone who wants to engage in them as a citizen: historic preservation, land use, recreation, affordable housing, economic development. Most places – including Pottstown – have a need for curious & informed volunteers to serve on boards and commissions, so definitely keep that in mind if your schedule ever allows it. And rambling is good and necessary! Lots of great ideas come out of rambling, which is really just brainstorming, right? You’re on the right track when you mention Paducah. I’m familiar with it, as are members of Pottstown’s arts community. We could learn a lot from what they’ve done, and I’ll be profiling them on the blog any day now. You’re also on the mark with the notion of a “perfect storm” of forces coming together for the good of the town. I like to think that’s happening, that employees, elected and appointed officials and active citizens have taken the ULI to heart and are righting the ship, each in their own ways. You could certainly talk to anyone in any of the agencies you mention, although you’d mostly be preaching to the choir, I think. As far as I know, they’re all working on specific activities to turn things around. There’s been some discussion over at the Save Pottstown! blog about the development of the riverfront area. Borough Council member Dan Weand asked if there could be some kind of survey of residents to find out what they would like to see in that area. I think something similar also needs to be done for the downtown (PDIDA area & then some). It’s a holiday weekend, but I’ll be reaching out in a couple days to see if/how anyone is following up on Dan’s request. And I will be trying to set up monthly gatherings, although “round table” might be too formal a description. I was thinking more along the lines of “happy hour.” 🙂 Just to get most of the people from various groups, elected and appointed officials and Borough staff to hang out for a little bit could break down some barriers. Oh, and let’s not forget to include Evan!